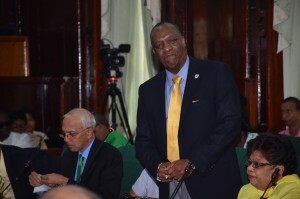 Government and opposition parliamentarians Thursday afternoon clashed over the political independence of the proposed State Asset Recovery Agency (SARA) and whether it is aimed at top members of the People’s Progressive Party (PPP). Minister of State, Joseph Harmon assured that the State Assets Recovery Agency Bill, being debated, provides for the Director and Deputy Director to be appointed by the House bipartisan committee and its remuneration and work plan will be approved by the National Assembly. “Let me take this opportunity to put this policy of politicization of the agency to rest. The expressed purpose of this legislation is to replace the State Assets Recovery Unit , which now operates out of the Ministry of the Presidency, with an independent agency that is not subject to ministerial oversight but reports to Parliament to ensure insulation and remove any perception of interference,” he said. Key players in SARU are senior leaders of the Working People’s Association (WPA) and the People’s National Congress Reform (PNCR), political parties that are part of A Partnership for National Unity (APNU). Rebutting Manickchand, the Minister of State said the Bill provides for the recovery of state assets through civil rather than criminal procedures for as far back as 12 years. Denying that government was about to embark on a witch-hunt , he said even persons associated with the current coalition government would face prosecution. 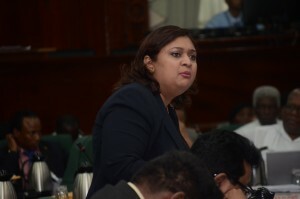 While Harmon was contributing to the debate, Minister of Social Cohesion, Amna Ally heckled “Priya, yuh in trouble” and “Anil, yuh gah ah bring back dem law books.” Manickchand was recently questioned by the police force’s Special Organised Crime Unit (SOCU) about her acquisition and sale of a house lot at Pradoville. Under Nandlall’s tenure as Attorney General and Minister of Legal Affairs, the production of law books to the tune of millions of dollars was bungled and had to be redone at extra cost. The law provides for the National Assembly to approve a code of conduct and code of practice of SARA’s staff. Manickchand accused government of setting the stage to target persons who have exercised their constitutional right to associate freely and violate the constitutional right to ownership of property. She signaled that the SARA Bill, similar to one that was abolished in the United Kingdom, would be challenged in the High Court. A practicing Attorney-at-Law, Manickchand argued that there are existing anti-corruption laws that could be enforced pending the refinement of the Bill by a parliamentary select committee. Under the legislation, no one will be charged, prosecuted or jailed as part of the process to ecover state assets from public officials and other persons linked.